Kalamazoo industries youtube channel. sign up today! 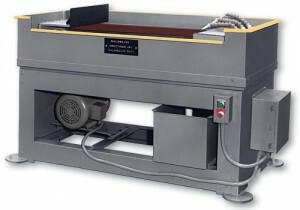 S14HW 14 x 103 inch Kalamazoo horizontal wet belt sander this designed for heavy duty aggressive sanding in various manufacturing facilities that need to sand, deburr, flat work, roughing and other various sanding/metal removal applications while keeping your material cool and not altering steel properties. The Kalamazoo Industries S14HW 14 x 103 inch Kalamazoo horizontal wet belt sander features a 20HP 3PH 220/440V TEFC motor, 14.5” x 36” steel platen, 14” x 18” tilt work table, magnetic controls with jog, air belt tension, easy one knob tracking, pump and tank system. The Kalamazoo Industries S14HW 14 x 103 inch Kalamazoo horizontal wet belt sander can accommodate various 14” x 103” belts to achieve your desired finish. 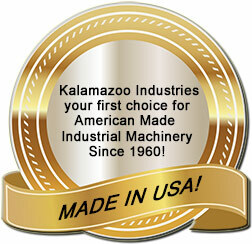 As with all Kalamazoo Industries machines, the S14HW is made in the USA! S14HW 14 x 103 inch Kalamazoo horizontal wet belt sander has applications in the following industries: Energy, Oil/Natural Gas, Petro/Chemical, Knife Manufacturing, Automotive, Metal Foundries, as well as many other Manufacturing and Fabrication environments. Also available DRY ! Great for getting parts FLAT !! 20 HP, 3 PH TEFC 220v or 440V (specify voltage at time of order). Mag controls with jog, 24 volts at push button. Model: S14HW, 14″x 103″, 20 hp.,220/440/60hz 3 ph. 24 volt at switch. 10 gal. coolant tank & pump. Model: S14HD, as above, less coolant tank & pump. Kalamazoo Industries S14HW 14″ wet horizontal belt sander cut sheet. Kalamazoo Industries S14HW 14″ x 103″ parts list.